It is very bittersweet to be leaving the classroom at the end of this week for the foreseeable future, as I enter the world of coaching. So, in an effort to not be a baby and cry all week, I am going to make our last week of school epic. We are having a science day, where we will do tons of science experiments all day long. I also posted recently about a really fun tech activity that is totally going to knock it out of the park. 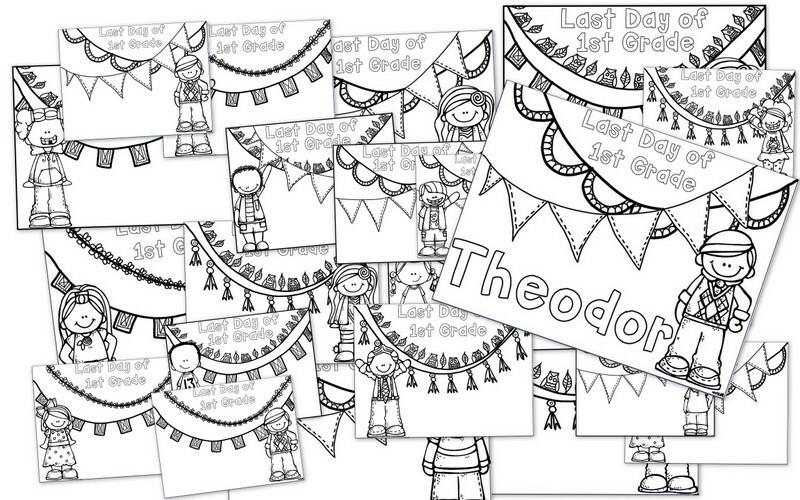 And finally, my most recent brainchild... GoNoodle Day! If your class is anything like mine, they could do GoNoodle all. day. long. And now, they can! I am devoting an entire day to GoNoodle fun. 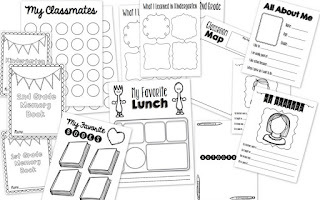 Now, I don't think even my little firsties have enough energy to actually do GoNoodle all day long, so I have paired some academic and some just plain fun activities to go along with some of our favorite GoNoodle activities. 1. We LOVE Koo Koo Kangaroo. Neil is my kids' favorite (I think it's the mustache, sorry Brian), and they love his T-Rex arms in Dino Stomp. After we show off our Dino Stomp skills, I am going to do a read aloud of one of my favorite books to read aloud: Goldilocks and the Three Dinosaurs by the brilliant Mo Willems. Predictions, drawing conclusions, maybe even a little inferring thrown in, and a whole lot of laughter. 2. 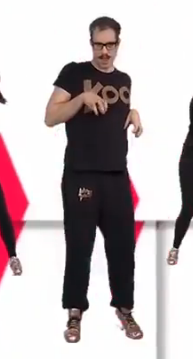 Those Kidz Bop kids know how to work it. And we love flailing around acting like we are working it too. They have three great songs with fun summer themed videos and dancing, and by golly on GoNoodle Day I might just play all three! Summer, I Love It, and Everybody Talks. 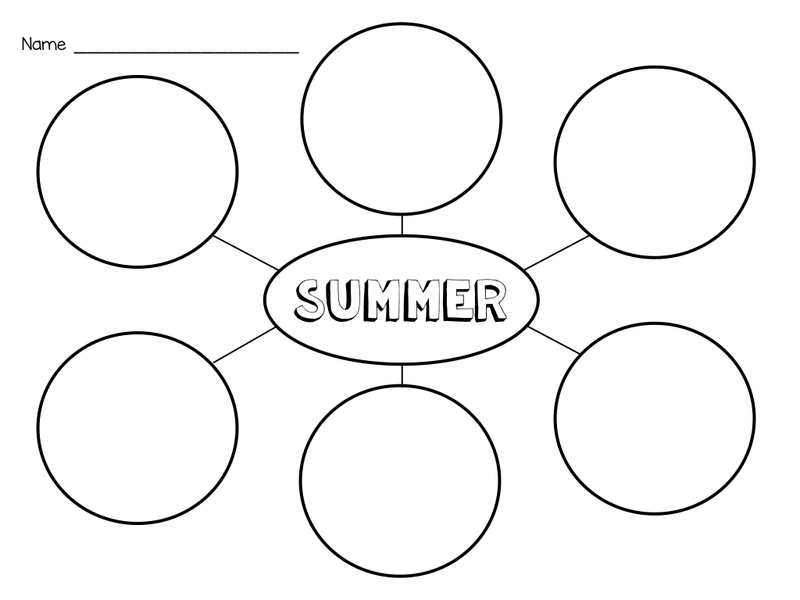 After dancing our little hearts out, we will sit down to rest and write and/or draw about what we like to do in the summer, using an information web to organize our thoughts (included in the free pdf listed above). 3. Run With Us really gets my future Olympians moving, and on GoNoodle Day we are going to practice the Long Jump. Afterwards, we are going to do some jumps of our own, and measure our distances. 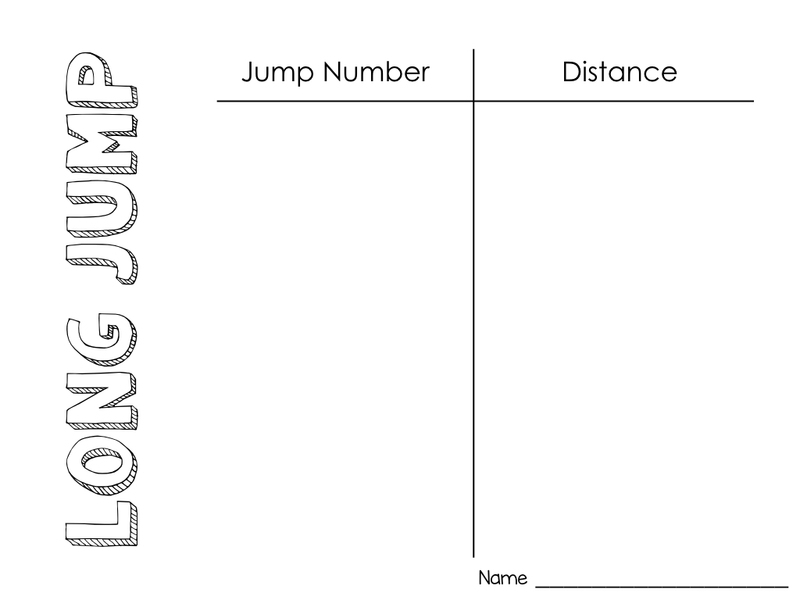 In partners, students will take turns jumping, then measure the lengths of their jumps (using standard or nonstandard units of measurement, whatever is applicable for your students). 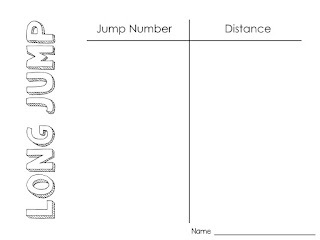 T-chart included for keeping track of jump measurements. 4. 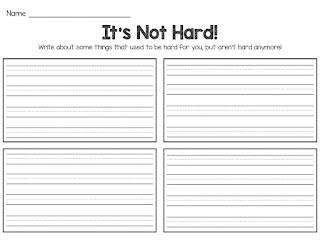 Moose Tube's "It's Not Hard" actually is quite hard, but we always love a good challenge. 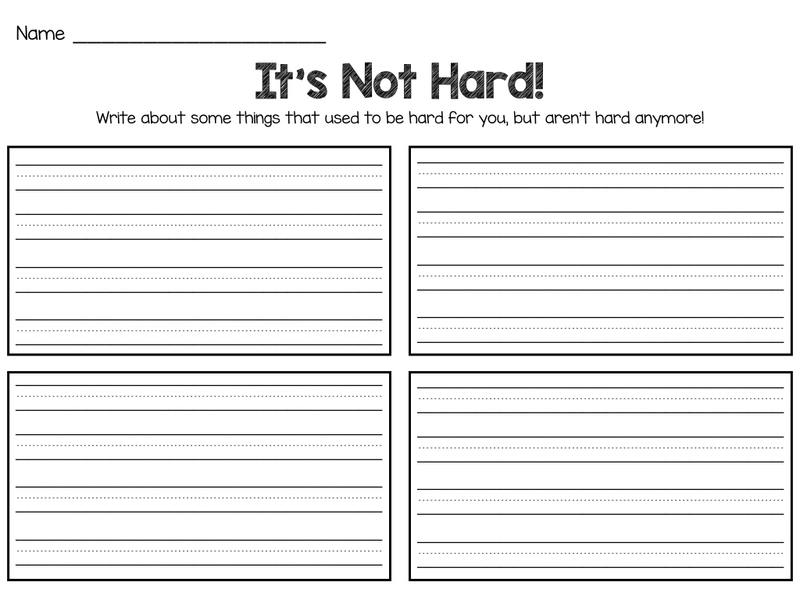 After practicing a few times, we will reflect on the past year and write about things that used to be hard, but aren't anymore! 5. Maximo always makes me laugh, but my kids never get his jokes. I make them watch him anyway, because yoga = peace. And peace is good amongst 29 first graders. On GoNoodle Day we will practice Willow Willow with Maximo, then read and discuss the classic The Giving Tree. It will be a good opportunity for some quiet, calm, down time. Namaste. 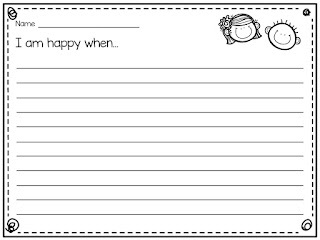 After dancing and getting happy, we will write about what makes us happy. 7. Koo Koo Kangaroo, we are coming back for more! Another favorite is Just Kidding. We are pretty sure that Brian does actually know how to count to four, but we have fun with this one anyway. After doing JK, we are going to have a joke party. I bought this set of jokes from TpT - https://www.teacherspayteachers.com/Product/JOKE-OF-THE-WEEK-2010022 - and can't wait for my kids to read them together. I can hear the roaring laughter already! If a joke set isn't in your budget (apparently my TpT budget is endless), you could find some online and project them, or have the kids write their own! Those are sure to be terrible. But will make you laugh in a totally different way! 8. Finally, an art activity! Don't worry, I would never make you get out the paints in the last week of school. That would be plain crazy. This one only requires glue and paper. And when you are done, if this is your last gluing activity for the year, you can do the always cathartic practice of dumping the whole tub of glue sticks/bottles into the trash can! For this activity, we will start with a Flow calming exercise called Rainbow Breath. 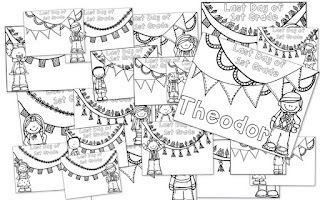 The kids will then make a rainbow paper garland. I found a great tutorial here - http://www.minieco.co.uk/folded-paper-garland/ - and while I haven't actually tried it myself yet, it seems doable! There is always the possibility of ending up with a Pinterest fail, but hey, it'll be good fine motor exercise! 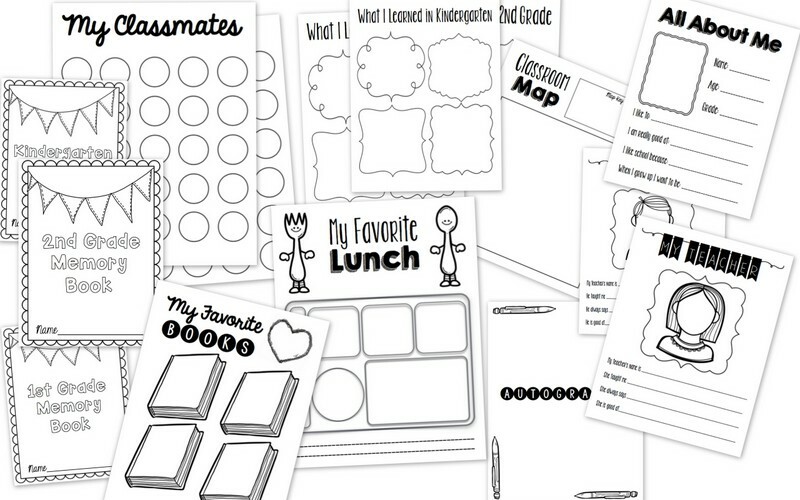 I hope your kids love GoNoodle Day! I can't wait for ours! 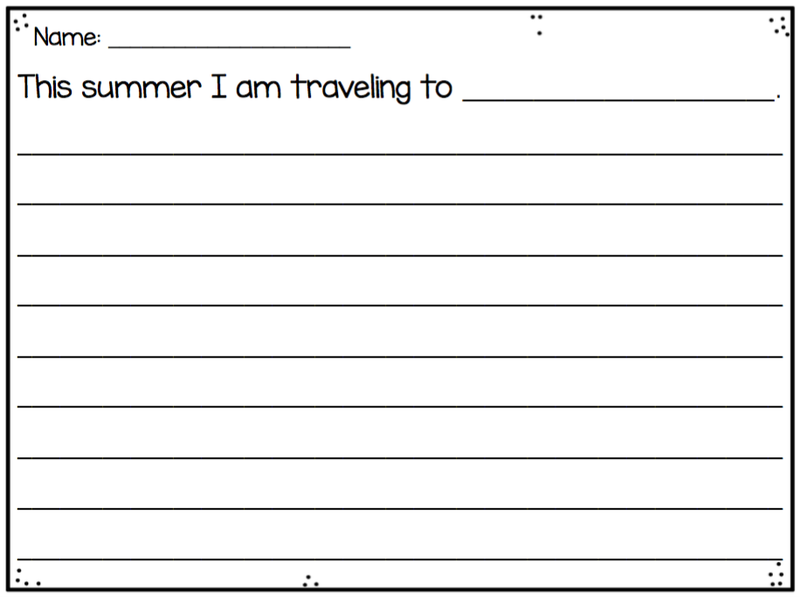 Oh boy do I have some fun end of the year activities to share with you. First, an iPad/coloring/writing activity for the books. This one is going to be a HUGE hit, for all elementary ages. 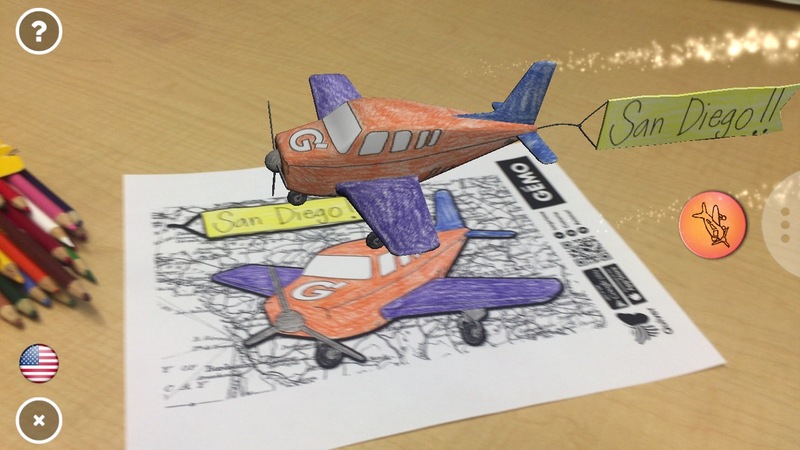 I discovered this really cool iPad/iPhone app called Quiver that turns a 2D coloring page into a 3D masterpiece. It is so cool, my kids are going to FLIP. There are dozens of free coloring pages you can download, but I chose two that I could turn into a school-ish activity. Totally school-ish, so your principal will totally approve. 3. 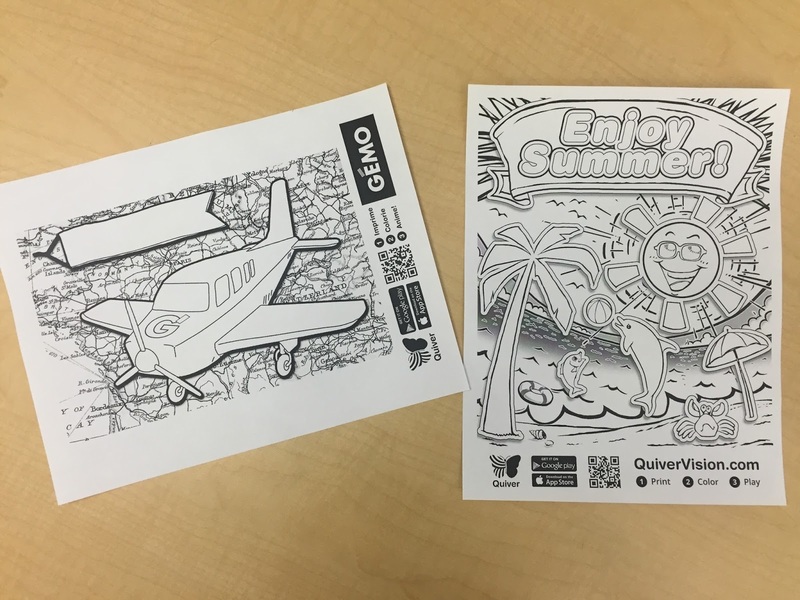 Pass out Quiver coloring page - Go to http://quivervision.com/ and download the airplane page. 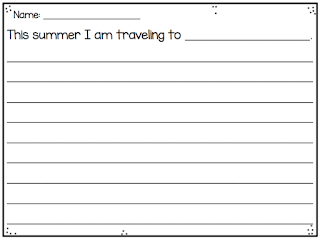 I also printed the Enjoy Summer page since it fits well with the summer travel theme. 5. Open up the Quiver app (download it in advance, duh). 6. Watch your picture come to life! It not only pops off the page in 3D, there are sound and movement effects too! So make sure the sound is turned on! The airplane pulls the flag with your destination, the propeller spins, smoke trails behind, and you hear the engines roaring! There is no way your kids won't like this. It is a guaranteed crowd pleaser. Since I have 29 students and only 6 iPads, I decided to give an extra coloring page for students to work on as they take turns with the iPads. There are dozens of free options on the website. Finally, my favorite Last Day of School activity. 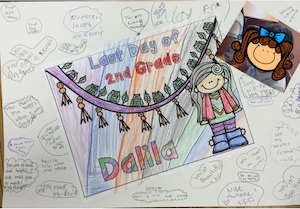 In my classroom we begin our last day the same way we started our first. Students walk in and find their personalized name coloring page in the circle, and sit down for our last morning meeting together. At the end of morning meeting, they spread out around the room and enjoy some quality time with their community, coloring and chatting. 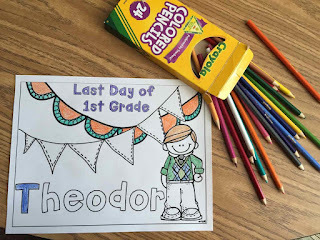 Then, each student glues their coloring page to a big piece of construction paper. Everyone walks around with a pen (omg, a pen?!) and writes nice messages to each other on the posters. It is a lovely feeling of community, the room gets very quiet and the kids take this job very seriously, thinking of just the right thing to write to each person. I hope you have found something you and your students will enjoy in your last days together! 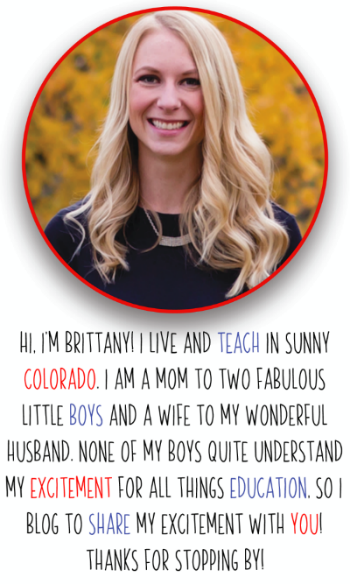 I had been dabbling with the idea of alternative seating for years, and once even bought some exercise balls for my second grade classroom, but that didn't end well when I went on maternity leave and the balls turned into play equipment rather than seating equipment. 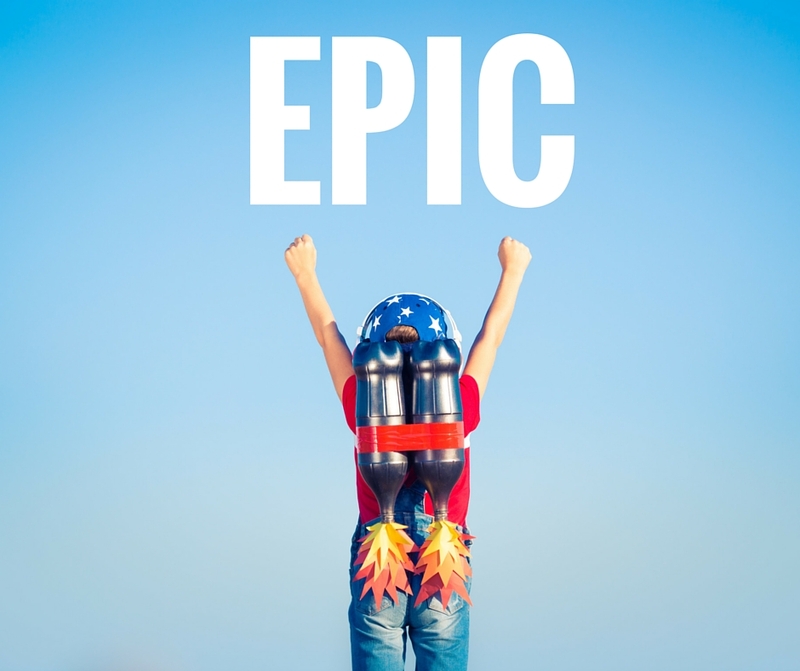 This year, with my move to a new school and a new grade level, first, I decided was THE year. And I will never go back. Alternative seating, also known as flexible seating (if there is a difference, please educate me, but until then I'm going to continue acting like I know what I'm talking about), has transformed my classroom in a way I couldn't have imagined. It has lowered stress and anxiety levels, heightened focus levels, and has allowed me to personalize the learning that goes on in my classroom. Here is a panoramic view of my classroom in all of it's flexible glory! Here is how our journey unfolded, in 3 steps! Provided to me at my school were a lot of tables and chairs, so I started by adjusting the use of what I already had by removing legs from a few tables for floor seating, raising a few tables to standing height, and leaving a few tables at chair height. Each step that I will be outlining involved a lot of class meetings and discussions about how to monitor what your body needs, and that everyone's body needs something different, and this one was no exception. After a couple of weeks, when everyone had had the opportunity to try out the different tables, most had settled into an understanding of what was best for them. The next step in our journey was to acquire some new seating options. 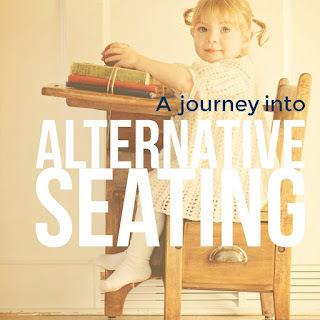 This can be an expensive step in an alternative seating journey, but thanks to the age of the internet, I did it with very little out of my own pockets. The only thing I bought myself was a set of 5 sturdy laundry baskets. They were $7 each at Walmart, and I was anxious to get started, so I went for it! I don't often shop at Walmart, but when I do, it's for cheap laundry baskets and school supplies. Now, if you don't have immediate luck on Donor's Choose, and haven't won the lottery, there are some cheaper options out there. Bathmats and pillows are something I've seen used, but I prefer hard plastics over cloth because of a debilitating fear of lice. I've heard good things about Scoop Rocker chairs, as seen here (http://www.overstock.com/Sports-Toys/American-Plastic-Toys-Scoop-Rocker-Pack-of-6/10458964/product.html). 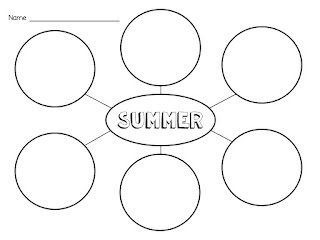 This step addresses the biggest question I get about flexible seating; How do you introduce this concept and the different seating options to your students? Don't they fight over the stuff? My answer - Take. It. Slow. I acquainted my students with one thing at a time. And each introduction was sandwiched with class discussions. I like to call this routine the "Expectation Sandwich". First, we circle up and talk about what is about to happen. What are the expectations? How will we appropriately use this space or this tool? Then, everyone gets a chance to try that particular seating option out properly. Finally, we have another circle discussion about how that particular seating choice is helpful, who it is helpful for, and how we know it is helping. In the expectation sandwich discussions, a big piece of the conversation (multiple times a day in the beginning) is that everyone is different, and everybody's body needs something different. Some of us feel just fine working in chairs at tables, some of our bodies prefer to lay on the floor with clipboards. Some of us like to stand up to help us focus, some of us like to sit on the floor. Some of us like to wiggle and move as we work, some of us like to be cozy and tucked into in a small space. I even had a mom come tell me after school one day that her daughter told her about our new alternative seating options, "I don't use the wiggle stools much because my body doesn't really need it as much as some of my friends." Perfection. In the beginning, yes, there may be a certain level of excitement due to the novelty. But if you can be very methodical in acquainting the children with the seating choices, and very patient in reminding them about how to choose their spots, the novelty will wear off, and it just becomes the regular day-to-day routine. Kids settle into the areas and options that they prefer, and there is now, in my classroom, absolutely zero conflict or disruption caused by flexible seating. The change that alternative seating has made in my classroom has been invaluable. My students have learned how to self-regulate and listen to their bodies. They have been given the gift of choice, the choice to do what is best for them. They are more focused, more centered, and more productive. This is the perfect time to start thinking about how you can make shifts in your own classroom for next year, so go for it! Remember - Adjust, Acquire, Acquaint. And how can I forget my #1 most important rule/motto with the kids about alternative seating - "They are tools, not toys!" Please feel free to hammer me with questions!